The Stage Editor allows you to quickly copy and rearrange stages with just a few clicks of the mouse. Since many courses are built from a number of similar stages, copying and then modifying a stage can be much quicker than creating a new stage from scratch. Clicking the Edit (pencil) icon in the top navigation bar when the Stage button is selected will open the Edit Stage Order dialog window. Here you can name and rename stages, delete stages, add a new stage, clone an existing stage, and change the order of stages. Each stage is given a bar with options related to that stage. The icon to the far left shown as three lines is used to rearrange the order of stages. By positioning the mouse cursor over the icon, the bar will become active. Left-click and hold the mouse while dragging the stage to its new location. Release the mouse button to drop the stage in its new location. There must be at least two stages for this feature to work. The next icon shown as two rectangles is the clone icon. It will create a new stage which is an exact duplicate of the cloned stage – including all targets, scoring, and settings. To duplicate a stage, move the mouse cursor over the clone icon. Once the icon is activated, left-click the mouse and release. A duplicate stage is created. By default, stages are given names Stage 1, Stage 2, Stage 3, and so on. However, you can easily rename a stage to something more descriptive by positioning the mouse cursor in the center of the bar near the stage name. Once the name is selected, double-click the mouse. This will cause the text to highlight. Type in the new name and press the Enter key when finished. Tip! 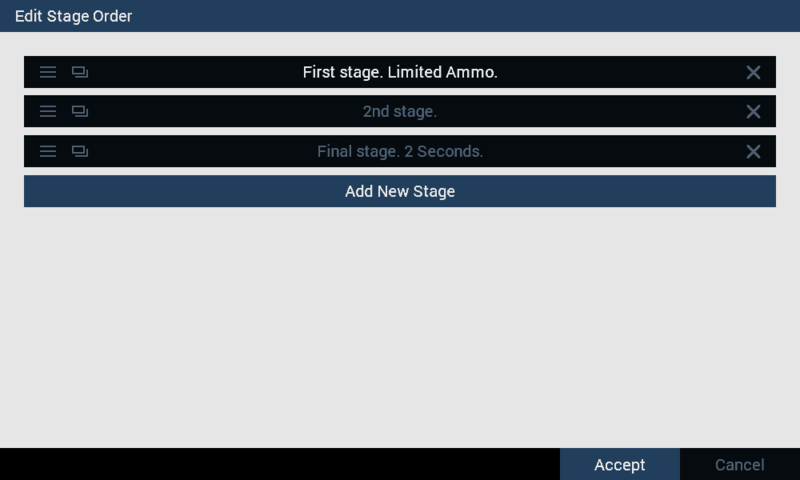 The after-action review dialog that appears after shooting a course of fire in DART Range, will list stages by their name. You may find it helpful to name stages based on their goals or content – for example Threat Stage or No Threat Stage. This will help add clarity to the after-action review. To delete a stage, position the mouse cursor over the far right X icon and left-click once the icon is highlighted. Every course requires at least one stage, so you may not delete the last stage. Important! Deleting a stage cannot be undone, however changes to the stages are not saved until you click the Save button at the bottom of the dialog window. If you make a mistake, simply click the Cancel button, and the course will remain unchanged. To add a new stage, left-click the Add New Stage bar at the bottom of the stage stack. A course is limited to a maximum of 30 stages. Note: Unlike the Clone icon, adding a new stage creates a stage will all default settings. Once you are satisfied with your changes, click the Accept button at the bottom of the dialog window. Clicking the Cancel button will cancel ALL changes you have made while the dialog window was open. Important! Any changes you have made using the stage editor are only saved to disk once you save the course using the Courses/Save Course option.